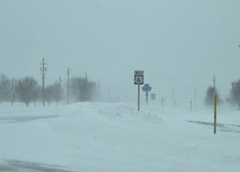 Snowfall piled up and blowing along the roadway. State Climatologist Harry Hillaker says Iowa hasn’t received this much snow from one storm, covering such a big chunk of the state, since the 1970s. The heaviest snowfall totals measured this morning included 16.2 inches in both Corning and Osceola, 15 inches at Toledo and Lamoni, 14.5 inches in Des Moines and 14 inches in Clarinda. Hillaker says portions of northwest Iowa received five to six inches of snow, while far southeast Iowa – near Burlington and Keokuk – received just one to three inches. But, roughly half of Iowa recorded a foot or more of snow. Hillaker believes the statewide average for the storm should top 10 inches. A Blizzard Warning remains in effect for the entire state through this evening. Wind gusts have hit 50 miles an hour in some parts of the state, while a gust of wind was recorded at 61 miles per hour in Esterville. Hillaker says Iowa had two huge snowstorms in March and February of 2007, but those affected much smaller areas of the state. This is the second largest snowfall for the capital city for the month of December. A storm that hit Des Moines on Christmas Day in 1888 produced 17 inches of snow. Des Moines was just over two inches short of that record as of 7 a.m.